Howard Phillips Lovecraft was born late in the 19th century, but it was not until after his death in 1937 that he became a worldwide icon of horror and supernatural fiction. Influenced largely by Lord Dunsany and Edgar Allan Poe, Lovecraft's stories are known for their unique assimilation of gothic themes into science fiction. Lovecraft's influence has stretched far beyond literary horror, as a nu… mber of his works have been adapted for feature films, television episodes, comic book tales and, in recent years, video games. 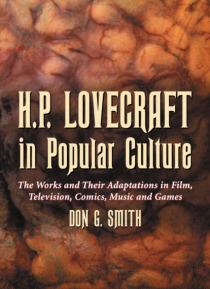 This scholarly study highlights Lovecraft's profound impact on 20th century popular culture. Early chapters introduce his complete writings, providing an annotated bibliography of the author's horror and science fiction tales. The works are discussed in the context of the Cthulhu Mythos, an invented mythology centering on ancient and alien beings interacting with the terrestrial world. Later chapters provide a filmography of motion pictures that credit Lovecraft or are identifiably adapted from his works, as well as a discussion of the works that have been adapted for television, comic books, role-playing video games, and music. The book concludes with a close examination of the Lovecraft legacy, commenting on his specific social and metaphysical ideologies and placing the author in context among such notable literary personalities as Mary Shelley, Nathanial Hawthorne, and Robert Louis Stevenson.